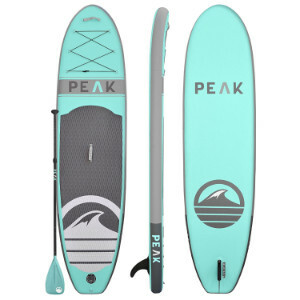 ISLE PEAK iSUP Review: Is This the Stand Up Paddle Board For You? 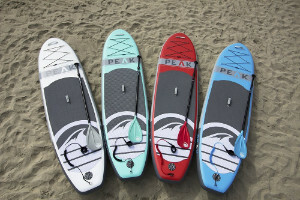 If you want affordable, easy, storage convenience, and the whole shebang, the Peak iSUP is definitely a must-have paddle board. We’re not just saying that lightly either. Since it came out in 2016, it’s been all the rave as riders have tested its ability on the waves! It’s the perfect, all-round length of 10 feet and 6 inches, making it great for adults and kids alike. Despite that it can cater to the kiddos, it’s no kid toy – not completely. It’s been pieced together with military-grade PVC and drop-stitch material for extreme durability. If the teens happen to get rough with it, it’s going to endure all the punishment they can dish out. It’s even durable enough for you to have your four-legged pals come aboard without worrying about punctures or scratches. If your dog happens to weigh 300 pounds, then you might want to leave him ashore. At full PSI, you can fool yourself that it might be a hard board if you didn’t have the sweat to prove you inflated it! Even with a little sweat, the dual action hand pump is easy to use. The iSUP comes fully equipped with everything you’d expect in a beginner’s package. The iSUP, pump, paddle, repair kit, carry backpack, fins, and even a coil ankle leash! How’s that for value? The Isle Peak iSUP has everything a beginner needs to get started. Even if there’s a family member or two that’s not so green to SUPping, it can cater to them and they can even push the weight limits since they’re more experienced. It’s an all-round board that can take on some light surf when it’s pedal to the metal! 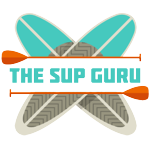 The iSUP package has everything that a fanatical SUP boarder could want and be crazy over for the cheap price! Even with all the great things about it, buyers appreciate the included ankle leash, the on-board deck storage, and the convenience of not having to strap it to the roof! However, it does seem that there was a manufacturer defect in more than one Peak iSUP – leaky seams. While this seems to happen right out of the box, and for others only after a few uses, Isle Surf and SUP have shown tremendous customer service in refunds, complete replacements, and warranty service repairs. Their customer service is outstanding! Although the quality issues have been addressed and there are enough instances to mention this flaw, most of the buyers haven’t experienced this defect at all. But, we say take your chances as you most likely won’t have a leaky seam at all! What is the Weight Limit of the iSUP? The Peak iSUP has a max weight capacity of 300 pounds. More experienced riders will be able to push these weight limits. However, if heavier riders are going to be using the board more often than not, it’s recommended you get a longer board for optimal performance to match the weight. You can find boards with a higher weight rating right over here. How much does the Peak iSUP Weigh? The iSUP weighs a light 23 pounds. It’s very easy to carry with the center carry handle. Even with all the gear loaded into the included backpack carry bag, you’re only looking at an approximate total weight of 30 pounds. What is a Dual Action Hand Pump? The included dual action hand pump is the tool you use to inflate the iSUP. It works in dual motion to pump air into the iSUP when you’re pushing down and pulling up. It cuts out inflation time and reduces labor. Can the iSUP be Overinflated? No! While the iSUP can handle a large amount of air pressure, the hand pump itself can only provide up to 15 PSI – the recommended PSI for the iSUP. Does the Isle Peak Paddle Board have a Valve Lock? Yes! The iSUP does feature a spring-loaded lock inside the valve to keep air inside, prevent air escaping, and from water getting in. There’s also a handy down-lock feature to quickly release air for deflation. Can the Paddle be Broken Down into Pieces? The paddle is a 3-piece unit and is very lightweight. It’s a carbon fiber paddle that can be broken down for easy packing in the backpack and for storage. This paddle is adjustable in length from 65″ to 86″. What is the Benefits of having a Carbon Fiber Paddle? Carbon fiber paddles are lighter than aluminum paddles. Completely put together, it weighs 30 ounces. They also float better. Because it’s lightweight, it cuts through water more efficiently providing for more torque per stroke. Can the iSUP be Stored Outside? It’s best protected when stored inside, for example, folded down in a closet. If you’re thinking about storage in a garage or shed, the warranty will be voided if temperatures are outside of the 32-90 degrees Fahrenheit range. To match the high quality Isle Peak paddle board is the Gold Coast Surfboards iSUP Aqua Discover! The price, specs, construction, accessories, and even the free coil leash are matched by the Californian company. California? Yeah, they stole a little bit of thunder from the Land of Plenty. But, like their name suggests, with this iSUP, you’ll be able to find your little bit of Gold Coast paradise wherever you and your iSUP can get afloat! Slightly lighter in price, the Ancheer iSUP might be worth a peek if you’re after something a little shorter. Although they say it’s 10 feet long, it’s really closer to 9’9″ – just saying, we’re picky! It’s built with the same construction and most of the same accessories. It does have a dual action pump and you only need to get this board as stiff as can be at 10 PSI. Less time inflating means more time on the water! 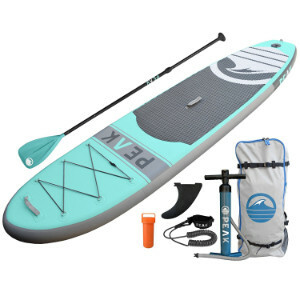 To SUP (sum) it up, the Isle Peak inflatable paddle board is a superb iSUP for the entire family! With rigid and stiff muscle beneath your feet, you can be sure to experience the joys of recreational fishing, SUP yoga, ocean surf, and oh yeah, paddling!